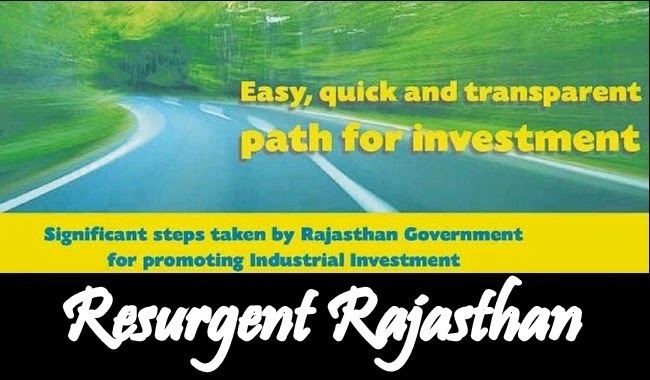 ‘Resurgent Rajasthan’ by Government of Rajasthan to attract investors in Rajasthan will be held in October-November under event 'Resurgent Rajasthan 2015'. In the regard , Raje asked the of ficials to focus on core sectors and thrust areas like textiles, mining and minerals, non-conventional energy , tourism, ceramics and elec tronics during the planning for the event. She said abundant areas of investment are open in Rajasthan and “we need to create a roadmap to work”. The chief minister further asked them to reduce the number of clearances required to be sought so that they are at a minimum and stressed on completion of tasks in a time-bound manner so as to make the process of investment easier. ‘Resurgent Rajasthan’ is inline with Gujarat Government's Vibrant Gujarat. Rajasthan is a land of opportunities embedded in its vast mineral resources; close proximity to the northern and western markets of India; educated and skilled labour force; and investor-friendly attitude of the State Government. A variety of crops grown in the green belts of Rajasthan, and the traditional skills of the people can be harnessed by the investors for expanding their business unit in the State. Thus, it is the right place for companies all over the world to invest their capital for making profits. The State has shown significant spurt in industrial activity, based on the exploitation of its agriculture and rich mineral deposits. It is manufacturing a wide range of products, which include synthetic and cotton yarn, cement, marble and granite slabs, edible oils, chemicals, rubber and plastic based items, fertilizers, electrical and electronics goods, ceramic and glass, etc. In addition, its diverse and beautiful landscape has made tourism in the State, a preferred sector for investment.